A historic day here in the States for online poker with the live launch of the Station Casinos/UFC backed Ultimate Poker. The client was opened to the public this morning and the first hand was dealt shortly after 9am Vegas time. Which prompted someone to immediately complain about a bad beat after busting on that very same hand. Welcome back online poker to the States! Some questions have been answered about the process involved with the Nevada based site. Players do not need to be located within the state to signup and create an account, thus preventing another unprofitable hack from stealing the AlCantHang username. Players can deposit on the site from outside Nevada, which will allow them to load up on the site before traveling and play as soon as they are within the state lines. Deposit options include MasterCard, echeck, real check, bank wire, and the option to walk up to the main cage in any of the 16 Station Casinos in Nevada. It seems the only downside so far, besides the small player base currently offered, is the system judging a player’s geographic location based on their cell phone signal. Verizon customers are unable to access the site and word is coming out about other smaller carriers being blocked as well. I can only assume these issues are being dealt with to allow everyone access. All things considered, it’s a pretty big day for online poker back in the US. The first step in the process which includes interstate compacts and hopefully Federal regulations as quickly as possible. WSOP grinders can start loading up their accounts because they now have a legal online solution for playing away from the Rio. In non-online poker news, poker good guy Blair Hinkle won his 2nd career WSOP Circuit ring at the Council Bluffs Main Event. He became the first player to win the same Circuit event twice with the first ring coming there in the summer of 2010. 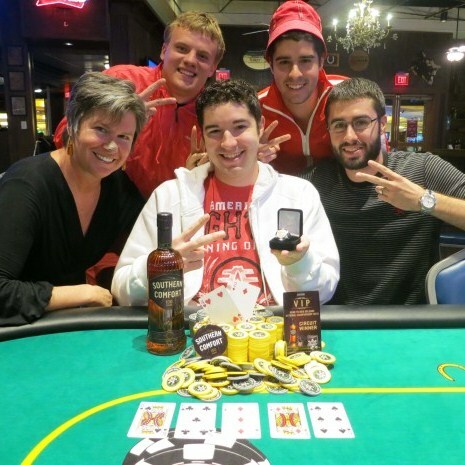 This 2nd ring will go along nicely with his WSOP bracelet for 2008, setting him nicely for a big run at the 2013 WSOP. Tweet of the Day – Ultimate Poker pro Antonio Esfandiari tweets a screencap of the first hand played on the site. For the record, I want to play every one of these min-raising (redacted) online players. Nate Silver: The man who correctly predicted US elections – The man just keeps getting interviewed. This time around it’s the BBC who sat Nat Silver down for a talk about statistics, the election, and some poker in the mix. Two California men get prison terms in pro poker ‘sextortion’ scheme – Opening the door for bottom feeders all over the forums, the Joe Sebok extortion trial was finally wrapped up last week with the two men receiving time in the big house. Hopefully this closes a sad chapter in poker and Micon can go back to shilling his BitCoins. Duke on Decisions – Seems my former Epic Poker boss has been making her rounds on the corporate speech circuit. Short-stack Shamus has a run down of a recent article about Annie Duke’s latest appearance. PokerStars Blog turns eight years old – I remember running off to the Bahamas years ago to provide a little moral support to Otis during the PCA (and cause myself severe liver damage) and now the PokerStars blog has turned 8 years old. The site has long been a strong supporter of the poker writing community and deserves all the kudos they receive. Phil Ivey is God – A deleted scene from the upcoming BET RAISE FOLD documentary, this one all about Phil Ivey. It’s good to see a flashback to Gloria Balding on camera along with Dr. Pauly and Jesse May.